Back to the West. After exploring Indian art, where better to land than one of the most influential churches in history. 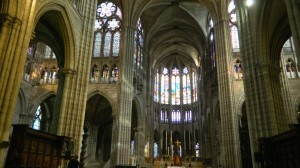 The abbey church of St. Denis is no less than the birth place of Gothic Style–one of the world’s greatest art forms. Above, you see a stunning contrast with the vast panoramas in Indian art, in which all life forms are integrated. Here we see Western culture’s use of lines to clearly partition domains in an order that’s rational and proportioned. But at the same time, these lines rise into the heavens far above, and aspire for a spiritual realm where shining light replaces the firm columns. This is one of the coolest things about Gothic style–the lines that divide the building try to transcend themselves and reach a more heavenly existence. The architects wanted to stress a linear order that rules the universe (a focus taken from ancient Greece and Rome) and overcome it at the same time. Gothic churches portray both the proportioned material world and the heavens. 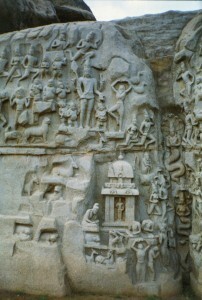 The frieze at Mamallapuram, in India, is similar and different. It too expresses a spiritual realm in which all things are integrated. But it does so without the firm lines and clear proportions–it does so without the ancient Greek legacy. And it does so without raising the spiritual world so far above us that we have to strain our necks to see it. The Catholic tradition says that there’s only one locus of divinity–access to the spirit is through one god, one savior and one church. But the Mamallapuram sculpture portrays a life force that all are integrated in, and which has many openings. So the world is more unified than hemmed in by lines, and more vast than proportioned (you can see how this view of life was reinforced in Indian narratives). But I’m racing ahead. 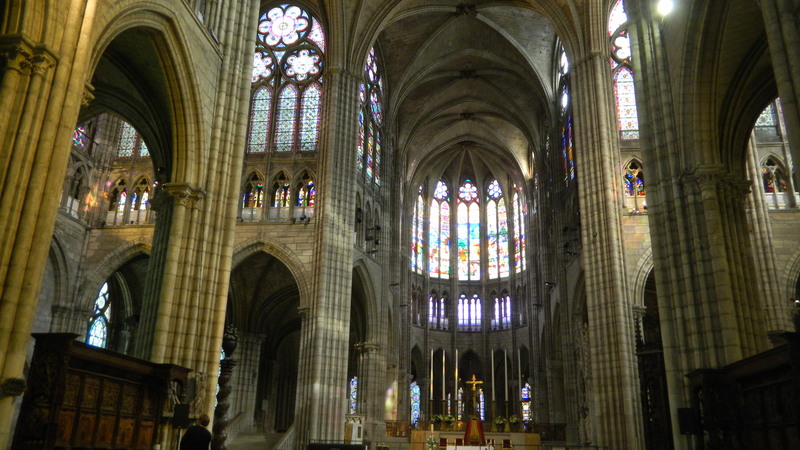 Most of what you see in the photo of the church of St. Denis was actually built about a century after Gothic style was born. As beautiful as the above work is, the most historically interesting parts of the church are at the two far ends–the mid section we’re in was updated a little later. In Gothic Style is Born, Part Two, we’ll look at the how Gothic style emerged–one of the most influential events in the history of art.